It’s a dangerous world, and Leftists are the reason. These lunatics and their lax laws have created environments that are more dangerous than war zones. The lack of jobs due to idiotic Leftist policies have caused many in the public to become desperate. Those who are not desperate simply believe they should get something for nothing. So the hardworking, taxpayer good guys remain to pick up the pieces. The good news is we are still winning. Leftists couldn’t get Hillary Clinton elected, and instead America got a real president. For now, we still follow the Constitution and the rule of law, thus the Second Amendment. And if you want to see why this is important, take a look at this video. Check out how this video plays out. A man enters the store. For the trained observer, the man is suspicious in how he walks, and because he’s not showing his right hand. However, the alert clerk notices this almost immediately. He senses what’s about to happen, so he reaches in the small of his back for his weapon. 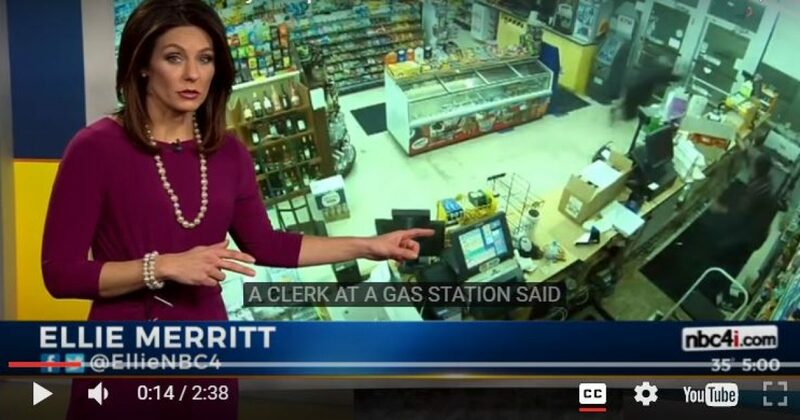 The armed robber tells the clerk to give him the money, as he begins to draw his weapon when the clerk pulls his weapon and fires. Emanuel Hamm, 27, was charged with aggravated robbery, according to the station. He reportedly suffered a gunshot wound to his hand. These scenarios play out multiple times a day in America, yet Leftists say we have a gun problem. We have a problem with Liberals. The man robbing that store is undoubtedly 100 percent Leftist Liberal Democrats Progressive. The armed robber did nothing to deserve the money he wanted to extort from the store owner. Further, he put the life of a man in danger, who had done nothing to him. Do we know why the man attempted to rob the store? No. But it was likely a drug habit, or some other lame reason, of course created by Leftists. The perpetrator was fortunate to only get shot in the hand. There is good news, however. Donald Trump has begun putting Americans back to work. The prosperity coming will even help Leftists stop their evil ways and put their energies into something productive.